The Jakobshavn is the glacier that dumps more ice in the ocean than any other in the Northern Hemisphere. It made the iceberg that “sank the titanic”. It has been receding for years, and the losses were accelerating, but then it astonished the scientists. But it’s OK, seriously, we’re all still going to bake in climate hell because all the models that didn’t see this coming are now saying it will be “temporary”. In a rush, climate-scientists hit auto-excuse-mode — saying the things they never say when there’s a bit of warming. It’s such a quirk, a blip: in a spot 1000 km away the atmospheric pressure changed “resulting in either warming or cooling” (I don’t think the laws of physics are too happy about that) and then ocean currents carry that up to Greenland which affects the glacier. Sure. We never hear them work so hard to explain some temporary warming. Ocean temperatures in the bay’s upper 250 m have cooled to levels not seen since the mid 1980s. So 30 or 40 years of warming was wiped out just like that? I wondered if Josh Willis’s job description was really the Oh My G*d principal investigator, but I see it may mean Oceans Melting Greenland (OMG) — except that isn’t happening. So our top glacier experts are just discovering that glaciers come and go, that oceans are important and that CO2 is not their only driver? This is news to them? He’s effectively throwing their own knowledge under the bus. It’s that bad. It’s interesting that they are announcing this growing glacier now, just as they have “found the reason/excuse” but not for the last few years when it was growing but they didn’t have an answer. For free and with no grants, skeptic Tony Heller pointed out it was growing two years ago. What does this mean? Perhaps not much, but if the world was starting to cool, stuff like this would start to happen more often. No way to know that answer at the moment. h/t Scott, and Sunsettommy for the Heller hint. Khazendar (2019) Interruption of two decades of Jakobshavn Isbrae acceleration and thinning as regional ocean cools, Nature Geoscience. Cycles, swings, call it what you like. Real climate change does not proceed in a straight line unlike what climate change warriors believe. Growing glaciers? Didnt the IPCC memo get to greenland on time? It gets in the way of a jolly good truckload of just-do-as-youre-told-dont-question-reality gold plated steaming pile of IPCC nonsense….. I think the good ship “SPCS IPCC” ( Steaming Pile of Cow Stuff IPCC ) will hit the iceberg of reality spawned from this Incovenient Truth. Obviously the memo missed! Fancy that. A glacier growing. Doesn’t Little Boy Willis know how glaciers are made and how they work? It seems not …. It’s going to be fun watching and listening to them about this naughty glacier! And poking the borax at them over the coming years of … Global Cooling! … a great glacier growing time! I can tell it’s not going to meet their expectations for quite some time! Grow and shrink and regrow: that’s what glaciers do best! That’s highly likely to be not before 2100, so we can scoff at them every year! In 1905 it snowed on Adelaide’s western suburbs. I have photos. They appear in various texts. This will happen again soon. The Earth’s magnetic field is weakening. Snow in weird places is coming to a place near you! Was that on the 31st of October? When, I have been told, the hills around Mudgee were covered in snow. He’s only saying that while Nat Geo are there pointing bullets at his head. Sure cooling passes and returns again, but to say it’ll happen faster is purely for Nat Geo’s headline. He can’t be that daft to believe what he said and no way he could ever prove it will happen in future. Besides, he just talked about ocean currents he somehow had no idea were a player and still doesn’t know when they’ll have an effect again. Unbelievable. It’s all explained by only two solar cycles, the 250 year de Vries cycle and the induced PDO. All despite the steady and natural rise of CO2 caused by ocean warming and unaffected by hamburgers, cow farts, motor cars and the utterly pointless construction of half a million windmills and more money than any other project on the planet since WW2. The most tragic waste of human resources in history to pay for endless parties around the world celebrating the religion of climate scientology. Soon the cat will be out of the bag, or maybe not. As is the trend with the ‘climate science’ establishment and the MSM, these sorts of changes may well be suppressed so as not to ‘alarm’ the public. Keep it quiet for long enough and the loudest of the hollow vessels can retire and disappear into the ‘forgettery’. Does anyone remember Tim Flannery? Many of the warmists know just as well as we do that the warming cycle is coming to an end. That, with the sun spot reduction combined with this end of cycle is going to bring some quite cool years or even decades. They are getting so incredibly noisy as they become desperate to get some freedom eliminating legislation in place, before this cooling totally destroys their scam. It will still be a close run race, as so many of the elites are on the warmists side. Thank god Trump came along when he did. Regardless of anything else, he has done more to slow the warmists march to population control than most of us put together. Tim is an Incubus – possibly a succubus with alopecia who desires relevancy and aplump teat. No problem . . . . . . after we’ve stopped the warming by stopping the CO2 we only need to create a few sunspots to stop the cooling. Another great post Jo, and further evidence that our Universities worldwide need to be emptied of all non essential activity. If only “scientists™” would spend some time trying to predict the next orbital arrangement of the solar system that will see us plunge into the next ice age. Fair enough, it may be a thousand years from now, or even five, but it’s an important area of research that’s been ignored. Wonder why? 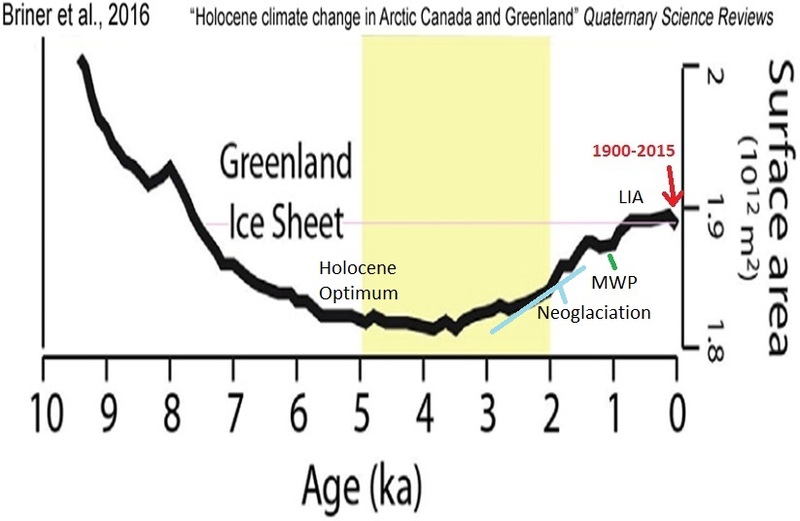 On the other hand, some in the Northern hemisphere may suspect that we are starting the next 100,000 year glaciation, we need some certainty about this imminent event. Students at Murdoch University are being taught that the Anzacs who fought at Gallipoli were “killers”, and Anzac Day is a “cliche”. These people have become totally lost in the world with No reference points to guide them. putting others down to elevate yourself. The ‘Milankovitch Cycles’ does not fit in with their narrative. said NASA climate scientist Josh Willis, a study co-author. Over the decades the water has been and will be warming from man-made climate change, he said, noting that about 90 percent of the heat trapped by greenhouse gases goes into the oceans. How? please explain Josh Willis? and can you please use science this time rather than magic. I suspect that “Josh” might have some trouble outlining the physics behind the term “trapping”. If radiative energy is picked up by greenhouse gases at sea level then said energy will be instantaneously shared with all other gases in the atmosphere by a process called conduction. The warm parcel of air will then rise up away from the ocean. The only trapping that has occurred in this scam is the trapping of huge amounts of U.S.dollars by China in its sale of 1950s solar technology? to the gullible West. Why not consider that warming water releases CO2? Or explain why the water is warming and not the air? Remember? That was the entire argument, that reflected infra red warmed the air, not the water. And how is the water going to keep warming from ‘Climate Change’ if the air is not? And if the water is warming, why is the water around this glacier so much colder? That’s not Science. Or even religion. It’s job protection. Ah.. But ya see TdeF, they’re absolutely sure of their “science” and quatrains as per Nostradamus et al until the money (and their job security) starts to run low, then they panic and begin furiously scribbling papers full of excuses saying their pet project needs more “study”. A couple of weeks ago here in San Luis Obispo, California, many local University (California Polytechnic State University at San Luis Obispo) and local high school students opted to skip classes and instead attend “Stop Climate Change Rallies.” Most of those skipping class couldn’t tell you the difference between science and a séance; but bless their little hearts, this new generation of “Seantists” knows the “séance is settled.” There is, however, one silver lining to all this. Every class missed in California’s ever more liberal education indoctrination system is one less hour of being fed BS. Now if we could only figure out a way to have a year-long “Stop Climate Change Rally,” we really might accomplish something. Downwelling IR radiation cannot heat water. It causes evaporation, which actually COOLS the top surface of the water since extra latent heat is drawn to help with that evaporation. This has been OBSERVED and MEASURED many times. As has the gravity based atmospheric thermal gradient. Warming of anything by increased atmospheric CO2 has NOT been observed or measured anywhere on the planet. Interesting that it was losing ice back in 1851 to 1913 when atmospheric CO2 levels were much lower, below 300 ppm. And it seems to have “been on vacation” between 1964 and 2001 with only minimal loss. Then from 2001 to 2009 it decreased (melted?) rapidly, then made slow progress to 2014. Lately it has gone into reverse and started expanding. Obviously the level of CO2 cannot explain this behaviour. Instead I postulate that the cause is mostly natural, but with a component of man-made influence. What influence but hot air? The level of hot air from AGW hysteria which peaked in 2009. (Thanks FOI) Yes, I know that certain sections of society have become increasingly hysterical in recent years but obviously there is less total hot air coming out from a dwindling band of gullibles. Another cold winter or two may even see the collapse of the IPCC. Graeme, all this proves that the pseudo scientists know absolutely nothing about the climate and their computer models are totally useless as a means of predicting anything. Shame (or lucky for them) they don’t have records going back 1000 years to the MWP. Their excuses would be accompanied with a change of underwear. Call me a skeptic, but I think more money is required to research this anomaly. There could be some serious climate change we don’t yet understand. So one glacier grows a bit. That is news. What about all the others? After all if this was a signal then the expectation would be that it would be apparent in all glaciers of a similar type, both north and south. It was always big news for the AGW scammers when it was retreating. And as we all know, there is absolutely zero-evidence that humans or human CO2 have anything to do with it. Having POC here on the blog has an upside. His contribution to Jo’s chocolate fund eases the obligation on the rest of us. How do you “know” it is only one glacier? In fact the majority of the world’s glaciers have been expanding. Have they? With a claim like that, you would surely provide a link. But no, just an assertion. You haven’t provided any evidence for CO2 warming yet, pfutz. I was very much on topic.. you just don’t like being put on the spot with evidence you know you CANNOT produce. You ask for evidence, yet you NEVER can provide any yourself. You forget, Andy, the level of proof for warmist delusional beliefs is the sum total of “Well….because…” and thats it. I wonder what State Patricia is in? I saw plates on a car in Victoriastan that said “The Education State ” and I imagined it wont be long before its “The Re-education State”…. Fair enough, we may need to be made aware of the sorts of activists that are out there, but! This excressence has served our purpose in educating us as needed. What purpose is there in its continued presence? Does Gettupim, the PNG branch of Get-Up, really pay him one dollar U.S. for every Red tick he provokes? Still, there is a plus, he no doubt contributes at least half of that for chocolates? KK, I very much doubt that pfutz has made a valid contribution to ANYTHING in his whole insignificant life. Antarctic contains 90% of the world’s glaciers. Antarctic mass has been expanding , as also has its glaciers. There has been lots of talk lately about Antarctica and whether or not the continent’s giant ice sheet is melting. One new paper, which states there’s less surface melting recently than in past years, has been cited as “proof” that there’s no global warming. Other evidence that the amount of sea ice around Antarctica seems to be increasing slightly is being used in the same way. But both of these data points are misleading. Gravity data collected from space using NASA’s Grace satellite show that Antarctica has been losing more than a hundred cubic kilometers (24 cubic miles) of ice each year since 2002. The latest data reveal that Antarctica is losing ice at an accelerating rate, too. How is it possible for surface melting to decrease, but for the continent to lose mass anyway? The answer boils down to the fact that ice can flow without melting. So in 265,000 years from now it will all be gone! Better build a Windmill NOW mate! GRACE satellite had serious deficiencies even when launched, so much so they sent up a mission to try to fix it. Sorry Peter, but not seeing any links to these claims. Like someone once said, with a claim like that, you would surely provide a link. How does ice melt below 0 C? Nature thought it was news, and it is an interesting study. If more glaciers were indeed growing, why were they not included in the post? If atmospheric CO2 does actually cause warming, how come you can’t produce any evidence? pfutz thinks “climate change trademark” happens right now and wasn’t happening from 1983-2008. All these glaciers are almost certainly more advanced than during the MWP and before, when many of them didn’t even exists, and trees grew where there are now glaciers. Big bloody swallow Fitz ! The biggest in the northern hemisphere ! An iceberg from it sank the Titanic ! Yes, there are thousands of glaciers, but this is the most significant with direct access to the Atlantic. If it is soaking up water, water levels will drop. Antarctica is also growing rapidly in the dry centre where the ice is 3-4km thick. We may see the tiny growth sea level start to stop and then rapidly reverse. Unfortunately we could be at the peak of the warming period, which would be a disaster for 7.5Billion humans. Plus we have wasted all our resources trying to cool the place. I think the Petermann glacier is advancing as well.Will check as I’m sending this while driving down a mountain road. Joking,of course! Has anyone looked at other glaciers for changes? This is only one glacier. Perhaps a study of glaciers on land might be revealing. What’s happening with the Himalayan glaciers where the ooceans are not a factor, but increased snowfall may be? Or perhaps the new Zealand glaciers. Yes it is warmer now than when most of these glaciers formed during the Little ICE Age. Be thankful of that fact. But it is still nowhere near as warm as before the LIA,, when tress grew some 3000 years ago where glaciers now exist. 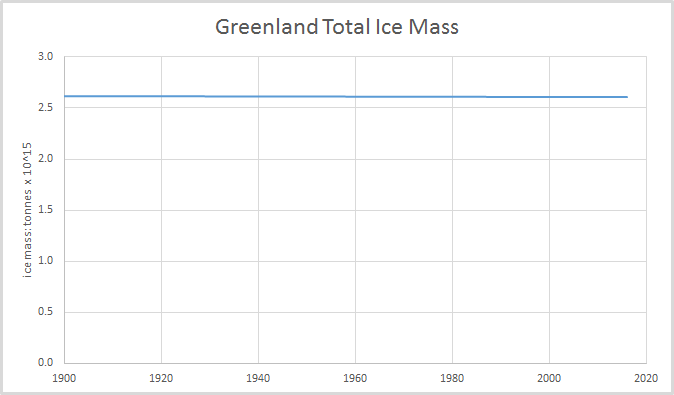 Greenland itself is only a small amount down in area from the highest it has been in 8000 years. The global climate has changed NATURALLY, and will continue to change NATURALLY in one direction or another then back again.. There is no empirical evidence that humans have anything to do with these NATURAL changes in the planets climate. All crap from the Guardian will get my red thumb from now on. Fake news must be condemned as the B/S it is. Been retreating since the LIA. only accelerated when it reached the less constrained portion in 2003, then stayed steady for a few years.. now extending as the AMO starts to turn and the surrounding waters start to cool. I wonder how much of it even existed during the MWP and RWP. Many glaciers around the world came into existence only during the LIA, COLDEST period in 10,000 years. Thankfully the world has warmed up a little bit since then, so its only NATURAL that glaciers formed when it was COLDEST would start to retreat. New York used to be under ice. “Over the last two million years, New York has experienced several Ice Ages interspersed with warm periods. Gigantic glaciers covered the state, and then retreated. Each wiped the landscape nearly clean—changing the course of rivers, widening valleys, and rounding mountaintops. As a result, modern New York landscapes are geologically very young. As the last Ice Age was ending 15,000 years ago. The glacier over Montreal was 3.2km thick just 10,000 years ago. Europe as we know it was covered with glaciers. Uninhabitable. Now we are trying to control carbon dioxide to prevent any warming? Are we quite mad? When did ecology become trying to change the weather and eliminate the people? Looks like a change is afoot. Looks like we’ll be living on turnips and leeks. 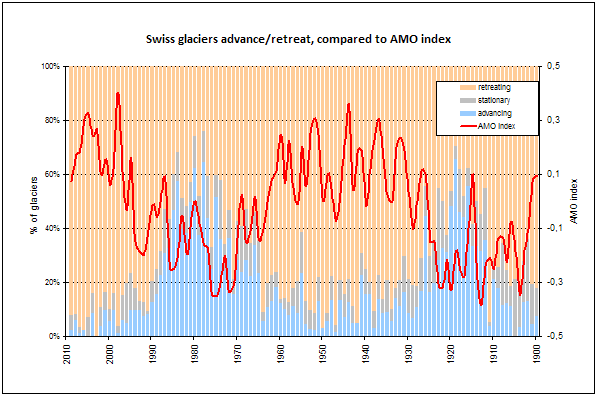 The last bit of the Swiss alps graph shows an equilibrium period of alternate losses and gains, i.e. stable. 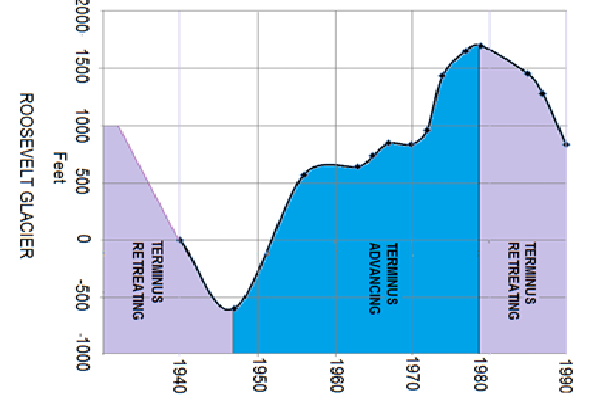 From the chart showing the glacier retreat it would appear there was retreat from 1851 to 1964, then stability, then retreat from 2001 to 2014. Where is the data from 1964 to 2001? The were exceptionally cold years for the Arctic, when sea ice extended. It ended just as the sea ice data from satellites was published. 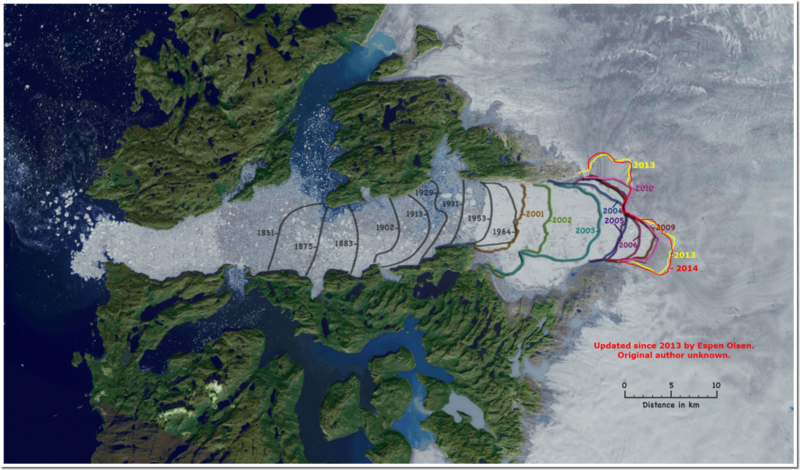 The retreat pattern of the Jakobshavn Glacier is different from Glacier Bay, Alaska where data on ice extent is available from about 1680. From 1680 to 1750 ice extent increased, then stabilized before starting a retreat around 1780. From a visitor’s map to the Glacier Bay National Park it can be seen most of the retreat was by 1880, and there has been little retreat since 1966. I covered this last December, with further data. Relating ice melt to global warming is problematic. Berkeley Earth produced a surface temperature anomaly for Greenland with data up to 2013. There was warming of 2C in the 1920s. Most of this warming was wiped out in the cooling through to the 1970s. From the 1990s to 2010 there was warming similar to that in the 1920s. Maybe glacier retreat/advance follows local warming/cooling patterns? Polar bear numbers have been increasing, glaciers stopped retreating and California’s perpetual drought ended to name just a few of his successes. At the end of his next term he should be in line for a Nobel Peace Prize although its credibility has been devalued so he may choose not to attend the presentation. I guess Willis must be one of those especially qualified ” “Climate” “scientists?” ” that I keep hearing about. As an expert OMG (and I just love that), I wonder if he’s heard of the southern circum polar current? No wonder the US cannot get to the moon again !! Attempting to use unicorn farts, no doubt ! And WTH is someone at a “Jet Propulsion Laboratory” doing spending time on ocean temperatures !!! ???? Maybe the inbuilt advantage of a slide rule was that it was solely operator powered? ‘But though, to landsmen in general, the native inhabitants of the seas have ever regarded with emotions unspeakably unsocial and repelling; though we know the sea to be an everlasting terra incognita, so that Columbus sailed over numberless unknown worlds to discover his one superficial western one; though, by vast odds, the most terrific of all mortal disasters have immemorially and indiscriminately befallen tens and hundreds of thousands of those who have gone upon the waters; though but a moment’s consideration will teach that, however baby man may brag of his science and skill, and however much, in a flattering future, that science and skill may augment; yet for ever and for ever, to the crack of doom, the sea will insult and murder him, and pulverize the stateliest, stiffest frigate he can make; nevertheless, by the continual repetition of these very impressions, man has lost that sense of the full awfulness of the sea which aboriginally belongs to it. The first boat we read of, floated on an ocean, that with Portuguese vengeance had whelmed a whole world without leaving so much as a widow. That same ocean rolls now; that same ocean destroyed the wrecked ships of last year. Yea, foolish mortals, Noah’s flood is not yet subsided; two thirds of the fair world it yet covers.’ H/t Herman Melville. Strange that a quote from Herman Melville’s classic novel should be in moderation. Sign of the times, sigh. Ah, the wh*te whale eh. Dave, so glad you found that funny too! And lets not forget Josh Willis was Mr Argo — the man responsible for wiping out the cooler ARGO buoys in the Atlantic in the early years. He knew they must be wrong. iirc, the Petersen Glacier has also been advancing recently. Down the rabbit hole……adventures in fantasy land…. Labor playing “chicken” with reality and backing away from electoral annihilation? “Labor has devised a plan to offer financial incentives to energy companies that slash their greenhouse gas pollution, sources say, as industry makes a last-ditch plea for political bipartisanship on Australia’s climate change policy ahead of the federal election. “The Morrison government has been agitating for Labor to reveal how it will meet its pledge to cut national emissions by 45 per cent and warns the goal will lead to higher power prices – a claim Labor strongly disputes. “Sources familiar with the draft policy say Labor is seriously considering linking that mechanism to the electricity sector. This would allow power companies to cut emissions beyond 45 per cent and generate carbon credits, which could then be sold to polluting companies needing to offset their emissions. So a financial “mechanism” will be the compensation? Now, I get that money isn’t real until you go to pay it back and that this great global rort is called banking. However,I just feel – yes, foolishly I feel – that someone, somewhere has to be doing some generating, some producing, some making for the world to really work. You can keep parking debt in speculative markets, real estate and car fleets for a long time so the price of a loaf of bread doesn’t go all Weimar or Caracas. Yes, they’ve shown they can keep that up for a few decades, even dissipating one debt bubble by soaking it into a bigger one with more bull markets, real estate booms and car fleet replacements. It’s actually quite ingenious. But in the end, I foolishly feel there has to be power generated and things produced. What annoys me is that when it all becomes apparent some boffin will get a Nobel for stating what I, and every cab driver and bar fly, already feel. Where’s our Nobel? maybe the magma activity underneath has eased off a bit. 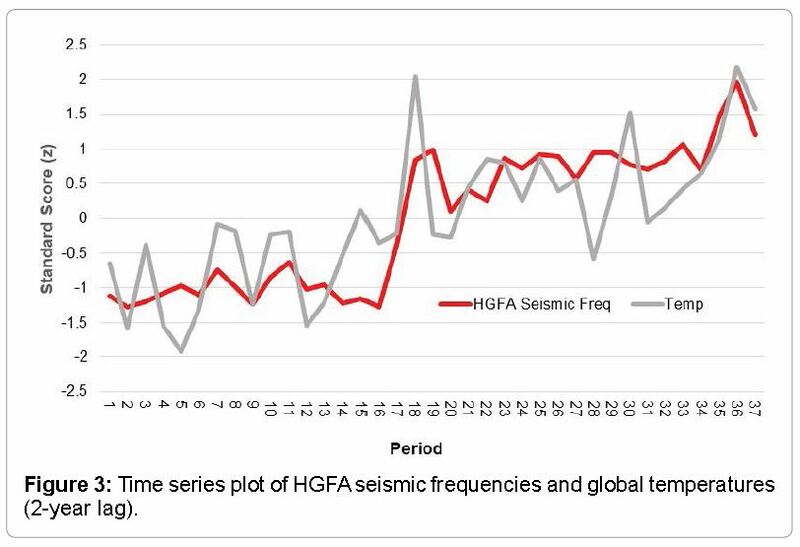 I think I posted this before, showing the 2 year lag between global seismic activity and UAH data. Is there something to it? It certainly looks like it. Once ahaom soem red thumb troll does not like the simple fact that geothermal activity heats up the water under this glacier…. Such abysmal ignorance of nature !! to the 2010 eruptions of Eyjafjallajökull and its further rumblings. So it goes in the era of non-Kardashian models and Publish-then-Perish science. The mighty and haughty will humble themselves…but if you go to the bathroom you might miss it. What most climate crybabies don’t know, is that glaciers are just rivers of compressed snow from the highlands, essentially no different than rivers of water. But they say almost nothing about creeks and rivers lowering levels by centimetres and instead concentrate on every dribbling icicle in the Arctic only because they can measure it by length and still not comprehend the dynamics. What’s a bet the rivers of methane on Titan are following suit. To cooling and now starts to grow. I hope AOC realizes how she’s being honored when she’s spoken of by her initials instead of her name. It’s a sort of recognition like JFK. Both of them being recognized for their accomplishments as it were, JFK for being a leader and a war hero and AOC for accomplishing more derision heaped on one person than ever before in the history of American politics. If a better investigation and analysis of that night had been done I think Ted Kennedy would have come out looking better than he did. I long ago lost track of the book and it probably went in the trash but from facts that did become known individually one at a time the probable truth was a little different. Kennedy and Mary Jo did go out for a little hanky-panky that night but they parked along the side of a road where their car was seen by a patrol car. Not wanting to be discovered in a compromising position Kennedy got out and left his lover for the evening to drive his car back. It was probably she alone in the car who drove off the bridge. This was backed up by the log made by the patrol car and by friends who noticed that Kennedy was surprised when he learned the next morning that his car was not back. It’s also notable that when the car was pulled out of the water the only occupant was behind the wheel according to someone who was there, not on the passenger side. We’ll never know the truth I suspect but if Kennedy had told the story above instead of what he did he might have been much better off. I can’t confirm whether the author’s version or Kennedy’s is correct. But I think the general story as I just told it is the more likely. It’s hard to believe that Kennedy could not have gotten her out of the car. After all the water was not very deep and he was an athletic type with the strength to have done it. While not directly on theme, I think this has a general relevance and interest. It’s a short report – just over 1 minute – of day 1 (today in Brisbane) of Peter Ridd’s court case against JCU (James Cook University). It includes an ongoing link. More good news for the Democrats and their enablers in the press. And what a wonderful gift to the skeptics who have taken it in the shorts for so long. A glacier is fed by the precipitation (snow to mere mortals like us) up at the top so if precipitation increased so did the length of the glacier — geology 101. I’m glad the glacier isn’t going to vanish. I just wish that if they’re going to tell me the thing is melting because of my carbon emissions they could at least once, just one time have someone go to where the glacier ends and take its temperature. That has always seemed like such a glaring omission from all the data being thrown around. Of course, it would mean no more than average temperatures and adjusted temperatures and any other temperature does in he great global warming fight. But if they would just do that then we’d know for certain if it was melting or not. It’s called having all your ducks lined up so they can be picked off without any difficulty. Isn’t it wonderful to have so many days in a row of good news for skeptics. Greenland’s Jakobshavn glacier is gaining ice due to cyclical changes in ocean temperature, but that doesn’t mean things are getting better. Another garbage report from someone who is too blinded by ideology to assess the facts..
Glaciers melting = global warming ! Glaciers not melting = Global warming ! 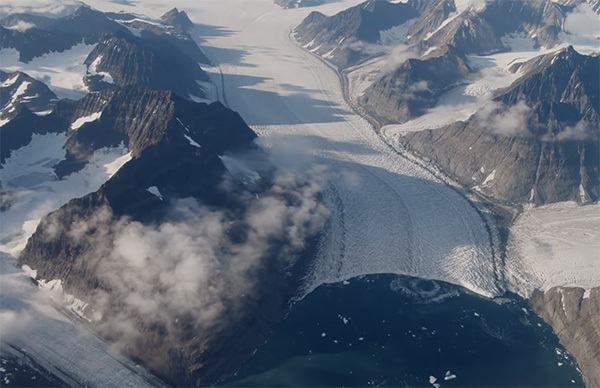 The researchers believe a recent influx of unusually cold water from the north Atlantic pushing into the Arctic has caused the glacier to grow slightly. 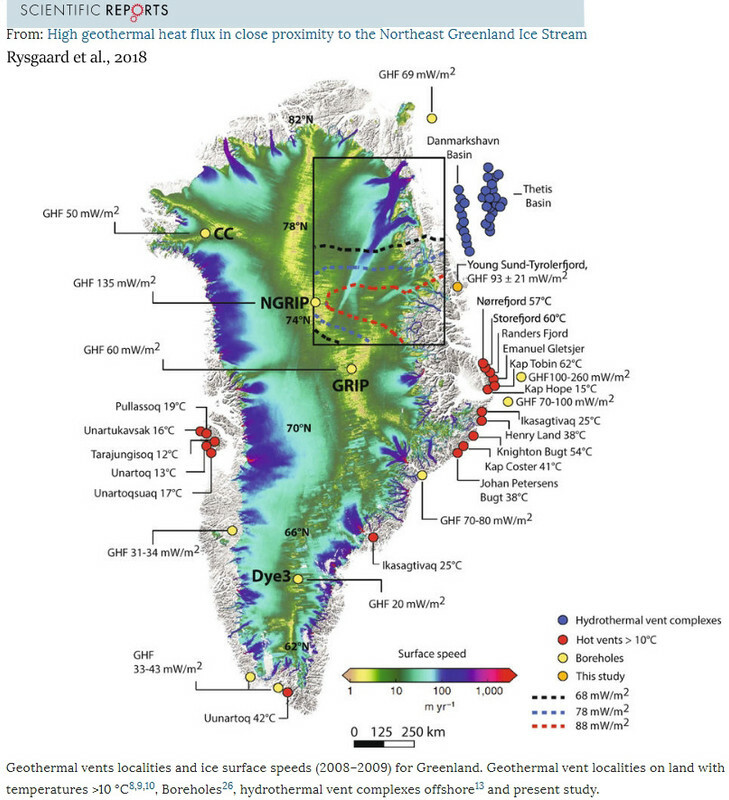 And other glaciers among Greenland’s 200 or more may also be expanding, suggesting changes may be harder to predict than previously thought, said Willis. Well hang put the flags!! Someone in UK has mentioned cycles!! But naturally without any depth. Besides, what’s NASA Jet Propulsion Laboratory doing with a glaciologist, an oceanographer and a climatologist? Surely NASA needs to know about the immediate weather, not the slow moving Climate? Since when did they do underwater research? And studying glaciers, which must be the slowest moving science in a world where things often move at the speed of sound up to fractions of light speed? Perhaps the funding is better? Why are American taxpayers funding ‘climate’ studies at a Jet Propulsion Laboratory? It is that long till the next launch? A NASA oceanographer, a glaciologist and a climateologist walk into a bar. “No, we just finished early”. Say, off topic I know, but how did the wonderful Green New Deal go in the US? It was presented to the Senate on Tuesday, U.S. time so overnight our time. The Senate was presented with the Bill, and a vote was then taken to allow the Bill to go to debate in the Senate. The result was 57-0 AGAINST proceeding to debate. 42 Democrats and one Independent voted ‘Present’, in other words abstaining to vote. Not one Democrat voted in favour of allowing it to even go to the debate stage. Skull and crossbones symbol on every page? “Very little of the drama on Tuesday mattered in a lasting way. The Green New Deal resolution was always doomed to fail, since Republicans hold a majority in the upper chamber” More about politics than science. And yet another “whole game on the bench” from an ever irrelevant pfutz. 57-0 was that what you said , TonyfromOz !! If the Democrats can’t even get their own people on side, what hope do they have of ever getting a debate on this. Three Democrats and an Independent who sides with the Democrats voted against it. This was a chance to show at least you supported even debating the subject. It seems they were not even willing to show their support, even if they knew it only had a snowball’s chance. So what is your explanation? And pfutz resorts to playing tiddly-winks, but only has a tiddly. Tony just gave you his explanation, dolt ! Simple explanation is the even the Dumbocrat senators KNOW that the “Green New Deal” is a load of hyper-expensive, economy-destroying, idiotic nonsense, to counter a non-existent non-problem. Even they aren’t dumb enough to put their name to it. Are you dumb enough, pfutz? You posted on the forum, anyone can answer you. Tony gave you his explanation, I just expounded on it. Too bad that lack of comprehension ability of your always gets in your way. Get over yourself… STOP your petulant arrogance. Now go back to your tiddly..
Not one of the 42 Dumbocrats there voted to even debate it. Aren’t you supposed to be undergoing desiccation and combustion therapy Peter Fitzroy? Poor little pfutz even FAILS at tiddly..
Comprehension level is ZERO, just like his evidence level. Reasons given at least 3 times. 42 out of 42 Dumbocrats didn’t want their names associated with a yes vote. More practice at tiddly needed, by yourself, pfutz. A LOSER at every stage. What is your purpose here, little childmind ??? This chart shows the change in Antarctic sea ice mass since 1900. Is that a chart of your brain function, posted by mistake. Yours would be a line at ZERO, just like your evidence level. Seems you don’t understand basic graphs either. poor puddle-pfutz STRIKES OUT and falls flat on his face in his own BS.. yet again. batting ZERO from 1027 now.. so sadly pathetic. The climate scientists calculate that the sea ice contains so many millions of litres of water and if all the sea ice was to melt because of climate change, sea levels would rise by so many metres. I’m not suggesting that the sea ice will melt, but my point is, if sea ice is like icebergs and 90% of the ice is below sea level, the only part of the melted ice that would affect sea level is the part above water, the part below sea level has already affected the sea level. Floating ice is lighter (lower density) than water. It displaces its own weight of water, i.e. a lesser volume (about 90%). The remaining 10% shows above the water line, but when it melt (with the rest) the effect is NO sea rise. Soe fellow called Archimedes worked this out over 2,000 years ago, but you know how backward Climatologists (and their gullible trolls) are. 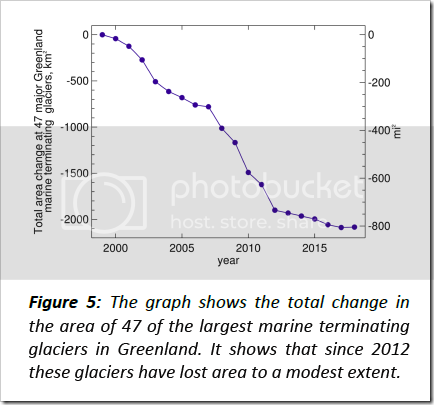 When they express alarm about sea ice melting they are showing how out of date they are. 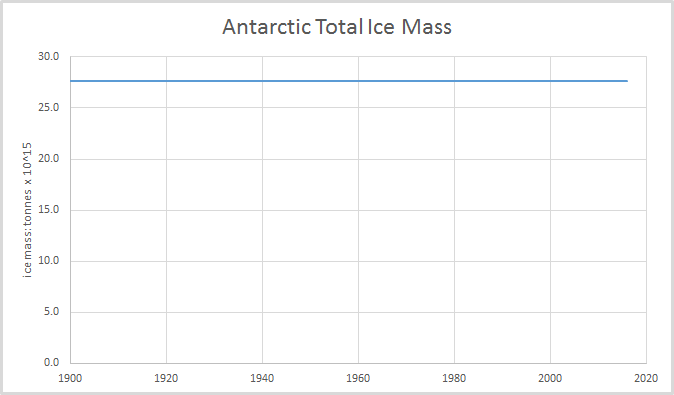 First chart is, of course, total Antarctic land ice mass. Perhaps pfutz would like to create his own version, (with a properly zeroed “mass” axis). Just for our amusement, of course. That does seem to be his only purpose here, a perveyor of slap-stick comedy. The Butterfly effect is simply that tiny changes in initial conditions end up resulting in major divergence in model run outcomes. Given that long-term predictions have to use Today’s result as initial conditions for Tomorrow’s run, this tends towards huge divergences over even short periods. And taking means or other lines through the middle of ensembles of such runs, doesn’t imply anything physical. It just satisfies modellers stuck in Model-Land because it looks plausible. The Hawkmoth effect http://eprints.lse.ac.uk/57935/ is a bit harder to explain succinctly, but my amateur rendition is this: Models have to use relatively linear simplifications of what in the real realm are chaotic, non-linear phenomena (e.g. turbulent fluids). This inescapably introduces what the LSE terms ‘structural instability’ into the heart of the model, and such instabilities become another source of divergences in model-run results. The net result of Butterfly+Hawkmoth is that model results over long time-scales bear no necessary relationship to any real-world scenario. As Kip Hansen notes: “There is a rising movement in other scientific fields to rein in the seeming over-confidence in models. Reasonable minds are beginning to shake their heads in perplexity as to how we got here — where, in some fields, model projections are demanded by organizations giving research or project grants, despite the known problems and the in-applicability of model outputs to conditions on the ground”. 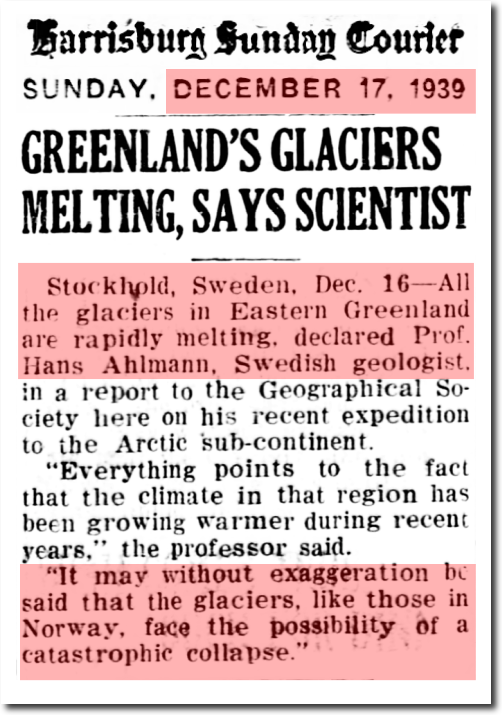 They were melting way back in 1939 ! !